After Donald Trump’s disloyal and treasonous display in Helsinki, numerous Republican lawmakers and officials have expressed “disappointment” and “concern.” Well, we need more than feelings. We need ACTION. Call your members of Congress and ask them what they will DO to stop Donald Trump, who is clearly acting on behalf of a foreign autocratic power who has attacked our elections and democracy. And if your representative or senator does nothing, tell them they are supporting Russia’s infiltration of our government and aiding in treason. See the call script below. Hello, I’m [name] and a constituent living in [your city]. 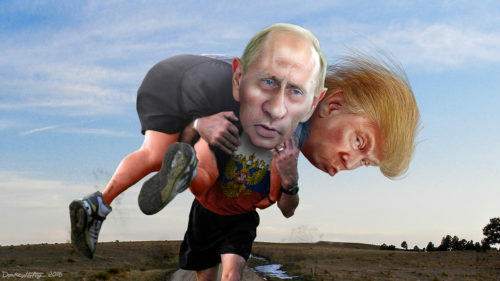 After the disloyalty Donald Trump displayed in Helsinki, I’m calling to ask if Representative/Senator [name] will do anything they can to stop Donald Trump’s power. (if Senator only) It is clear Donald Trump is acting on behalf of a foreign government that attacked our country to elect him. Will Senator [name] stop the illegitimate nomination of Brett Kavanaugh to the Supreme Court? Why not? Even after 12 more federal indictments of Russian government officials in their cyberattack on the U.S., Donald called the Special Counsel’s investigation a “witch hunt.” Will Rep./Sen. [name] vote to protect the Special Counsel’s investigation into the Russian attack on the U.S.? Why not? The Department of Justice recently arrested and charged Mariia Butina for being an unregistered Russian agent and infiltrating the Republican Party and the NRA to push Moscow’s agenda. Will Rep./Sen. [name] use Congress’s power to investigate Republican Party officials and the NRA for their ties to Russian spies? Donald dismissed our intelligence community and supported Putin’s denial of attacking our election. Former CIA Director John Brennan called this “nothing short of treasonous.” Will Rep./Sen. [name] call for Donald Trump’s impeachment? If Rep./Sen. [name] does nothing to stop Donald Trump, he/she is supporting the Russian infiltration of our American government and is aiding treason against the United States.